One of the most frequent questions I am asked is whether cats grieve or mourn the passing of a feline or human companion. When a cat dies, owners often notice behavioural changes in their remaining cats. Some of these are due to adapting to a changed hierarchy, but other behavioural changes are due to a sense of loss. Many cats grieve the loss of a close human companion and others show signs of loss when a canine companion ides or goes missing. It is impossible to say exactly what emotions cats feel, but when a close companion goes missing they are certainly be aware of the absence. It is unlikely that they mourn in the human sense of the word, but there will be some behavioural changes as they adjust to the gap in their lives. Grief is the result of abrupt or unexpected severing of attachment. Cats are aware that a familiar person or companion cat is absent and may search for that person or cat. The death or absence may change an established hierarchy as well as being the absence of a familiar companion. While this is not the ritualised grief of humans, the sudden absence of something familiar is distressing to many cats. Mother cats whose kittens were taken away and destroyed often looked for their kittens for many days, all the while pacing and crying out. As well as the physical pain of engorged mammary glands, the cats displayed mental pain. Grief has been observed in many wild species following the death of a mate, parent, offspring or pack-mate. For example, elephants have been seen to caress the body of a deceased companion and even to caress elephant skulls. Feline grief at the death of a long-term human or feline companion can include severe mental disturbance. Grief varies according to the individuals and some cats show little grief (some are reported to exhibit glee at the death of a sparring partner) while others can be deeply traumatised. In the past, this variability caused some scientists to dismiss the concept of animal grief as anthropomorphism on the owner's part. Such scientists forget, or ignore, that fact that humans are equally variable in how they express grief. Grief is a reaction to the sudden absence of something or someone who caused happiness, satisfaction, comfort or reassurance. The absence of a familiar part of the environment causes sadness. The continued absence of that person or thing can lead to stress. In the context of a bereavement, this stress is termed grief. The major difference between human and feline grief is that cats grieve for familiar and close companions while humans show grief for a distant relative or for a public figure. Cats lack the abstraction (and the memory capacity) that allows humans to grieve for someone we have never met or who has been absent from our life for a prolonged period of time. Humans often have elaborate or ritualised ways of dealing with their grief. Cats may become withdrawn or, at the other extreme, over-attached and "clingy". I have personal experience of a pair of cats whose owner had died. The cats refused to eat while in the shelter. To reduce stress, they were fostered in a household and the vet prescribed appetite stimulants. One cat recovered but remained withdrawn for a long period of time. The other continued to pine and became critically ill until it had to be euthanized (prolonged fasting results in liver damage). Its behaviour was so severely affected that the foster carer considered force-feeding unsuitable; the cat had no interest in life. Post mortem showed no sign of disease except for that caused by failure to eat. There is one instance where a streetwise cat was believed to have committed suicide by deliberately walking in front of a truck a few days after the owner had died; however the cat's motives cannot be verified. Humans have long been believed to be the only creatures that cry in sorrow or grief. There is some evidence that other animals form tears when in physical or emotional distress. Cats may express grief through nightmares (quite possibly a dream of the missing person has been replaced by wakefulness and the abrupt realisation that the person has gone). 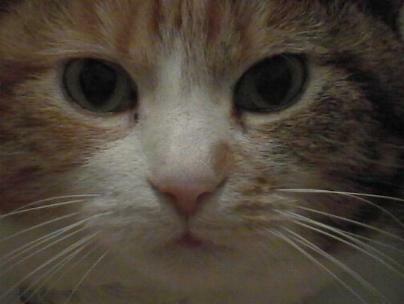 One of my rescue cats, Sappho, had repeated nightmares after the traumatic death of the owner in the cat's presence. Sappho woke up whimpering and fearful from sleep and required physical reassurance from me. If this happened at night, she actually climbed into bed and hid as far down the bed as possible, crying out (initially at a rate of one vocalisation per second) until her fear and grief subsided. As well as being clingy, she often woke me from sleep as though afraid that I had also died. This behaviour continued for several months, presumably until the traumatic memories faded. The sudden absence may be due to a person leaving home e.g. a youngster going to boarding school or university or leaving home entirely; an ill or elderly family member goes into hospital or a nursing home; divorce; another pet goes missing or is rehomed or because the cat itself has been rehomed. All of these leave holes in a cat's life and, depending on how attached the cat was to the missing person, can cause the reaction we call grief. Unlike humans, cats do not understand the concept of temporary separation due to school terms/semesters and any long separation is, in the cat's mind, permanent (when the youngster returns home these become welcome visits rather than a return to normal). The display of grief in cats is due to the absence of someone familiar. In humans it is, in part, due to the realisation that we will never see that person alive again i.e. to our understanding of the permanence of death. Some researchers believe a cat's concept of death is similar to a young child's concept of death i.e. they lack the concept of death being a permanent state. Cats appear to comprehend a state of someone not being alive - body temperature changes, smell changes etc. From my own observations, whether they make the link between a corpse and someone previously alive is not certain, but many cats stop looking for an absent companion after being shown the body of a deceased companion. Therefore cats probably have some comprehension that something dead cannot become alive again. This may be linked to the fact they are predators. Some owners ask whether it is best to let the cat see the body of the deceased companion. This is not always possible, for example when a human companion dies in hospital (bodies are rarely laid out in the home these days), when the cat dies at the vet surgery and is sent for cremation/burial from there or when there is no body (the absent cat has gone missing or been relinquished to a shelter or new home). It has been known for cats to wait at the window, or sit on a gate-post, waiting for the absent party to return. If the deceased has died at home or you are bringing the body home and there is no danger of infection then it is a personal choice whether to let the cat see the deceased. 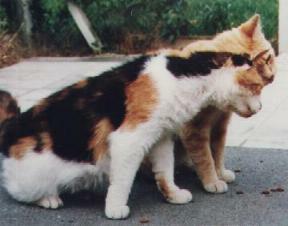 Some owners say that the surviving cats do not search for a companion, having seen the body. Others say that any medical smells on the body disturbed their other cats. They may sniff around the body, lick it and maybe try to wake their companion before concluding that their friend has gone. If there is no danger of infection and you believe that it will help your other cats come to terms with the loss of a companion, then by all means allow them to see and smell the body. 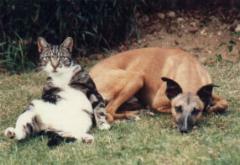 My surviving cats have often sat in the garden to oversee the grave-digging and burial of a companion. One of my cats regularly sat on the grave of her companion cat for years after his death. When the family structure is disrupted by the death of a person or another pet, life changes for the surviving pets. In cats, whose sense of smell is better than ours, this includes the absence of particular scents. As highly territorial animals, the status quo of who owns which resting place or right of way has also changed; if there are several cats in the household some of the unease (and occasional conflict) will be due to dividing up these territorial rights among survivors - not dissimilar to inheritance issues in humans. If the cats were sociable, the surviving cats may search, cry out (yowl or frequently miaow) or even pine. Other changes include sleep pattern changes, loss of interest in favourite activities, withdrawal ("sulking") or conversely separation anxiety, depression and eating pattern changes. Because stress hormones are secreted, there may be physical effects include stomach upsets, hair-loss (often through over-grooming since grooming is a comforting activity) and inappropriate toileting. They will need individual attention and reassurance. If they were unsociable or indifferent to each other, the survivors might simply rearrange themselves into a new hierarchy, dividing up their former companion's territory between them. Sometimes the surviving cat(s) blossom if they were previously bottom of the pecking order. Cats are not hierarchical in the same way as dogs, but there are still boss-cats and under-cats. Some owners notice their surviving cats taking on behaviour patterns of the missing cat. There is nothing supernatural about this - certain privileges and places once accorded to the missing cat are now up for grabs. This means the prime spot on the bed or being allowed to eat in a certain place. In all likelihood, the deceased cat defended these rights during its lifetime (maybe simply by staring down its companions) and the survivors see these behaviours as being part of the hierarchy. The first stage of grief is activation. During activation, the bereaved cat may spend hours or days looking for the missing companion. If the missing companion is a human family member, the cat may approach the door whenever someone enters the house. Outdoor cats may search their territory or sit on the doorstep waiting for the absent companion. If your indoor/outdoor cat starts searching, you may wish to restrict its movements for several days as normally home-oriented cats (and dogs) have been killed on the roads as a result. This stage is followed by depression. Over a few weeks (occasionally longer), periods of depression grow shorter and less frequent and normal behaviour returns. Normal behaviour may include some permanent behavioural changes related to changes in territorial rights or social standing. On average, the healing process takes between two weeks and six months. During this time, a grieving cat will need reassurance and attention. This doesn't mean forcing attention on a withdrawn cat, but it does mean little things such as offering food treats, catnip or new toys to draw a withdrawn cat out of its shell or to reduce a suddenly clingy cat's over-attachment. If the cat is severely affected or shows no signs of overcoming its grief, a vet may prescribe anti-anxiety medication. You may also want to consider complementary remedies, but if you do, make sure they are ones approved for cats since many human preparations are toxic to cats. There are a number of suitable homeopathic remedies and suitable Bach remedies. If the cat is now on its own, some owners ask if they should get it a new companion to prevent loneliness. While this may work for the more sociable and extrovert breeds, it doesn't work for all. The new cat will be seen as a stranger and a territorial invader. For this reason, if you anticipate the death of a pet due to age or non-contagious/non-infectious illness, it is usually better to introduce a new companion before the ailing pet dies to allow the newcomer to form a relationship with the existing cats. Allow the surviving animals to work out their new social order themselves. As a human, you will miss subtle scent and body-language cues that they use. Also try not to unintentionally reinforce any behaviour changes unless you are willing to accommodate permanent changes. Although food treats and extra attention will help a depressed or withdrawn cat in the short term, try not to let the cat become more finicky or more over-attached (this can lead to separation anxiety when you leave the house for any reason). Cats are creatures of routine so try not to change routine too much as this will cause additional stress. If the absent companion was a dog (that needed walks) or a person, a change in routine will be unavoidable. If possible, try to establish and stick to a new routine, not too dissimilar to the old one, as soon as possible. This will allow a grieving cat to deal with one stress factor at a time. Though it may seem an odd question, how are you responding to the loss? Cats are sensitive to changes in human emotions, behaviour and routine. If you are upset, your cat will respond to this and may become anxious, depressed, agitated or physically unwell. If you are finding it difficult to come to terms with the bereavement, whether human or animal, you may find it helpful to talk to a bereavement counsellor. There are a number of online communities as well e.g. alt.support.grief.pet-loss . When there has been a human death in the family, there will probably be upheavals and pets' needs are low on the list of priorities. Try to make time for your pet, preferably a regular time each day. If there are numerous arrangements to be made following a death, consider boarding your cat at a cattery (preferably a FAB-approved cattery if you are in the UK) for a week or so to allow you to concentrate on such matters. Explain the situation to the cattery staff - good catteries will notice signs of stress in a cat and it helps them if they know the underlying cause. Sometimes a change in routine is unavoidable when a human companion dies and the cat has to be rehomed. Shelters and adopters of such cats must be prepared for the behavioural changes detailed previously - these will often be more severe than if the cat was able to grieve in familiar surroundings. 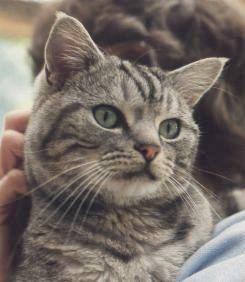 In addition to bereavement, the cat is facing the additional stress of a change of home, a change of human companions and unfamiliar surroundings and scents. Don't expect such a cat to be playful and companionable immediately you adopt it. Be tolerant of toileting accidents and if it want to spend time alone, allow it to do so, but keep a watchful eye on its eating habits and physical appearance (e.g. self-neglect, weight loss). Once it has accepted you as the new caregiver, it may become clingy - having lost one human in its life, it may not want to let you out of its sight. If you are away from home during part of the day, you could leave a recently worn tee-shirt in the cat's bed as a comforter. Alternatively, it may remain aloof to begin with as though afraid to build up a new relationship so soon. Don't press attention on an unwilling cat, but spend time in the same room and talk to it (stroking it if possible) so that it knows you are a permanent fixture in its life. Encourage it to interact with you. The settling-in process may take longer and be slower, so be patient. WHAT IF MY CAT DOESN'T GRIEVE? In humans, it is sometimes considered unhealthy to not grieve. Many people believe that feelings are bottled up or unresolved and will cause problems later on when some other event triggers delayed mourning. This is highly individual and not all of us feel grief in the same way. The same goes for cats. Some owners complain that their cats show "inappropriate" gleeful behaviour as though celebrating the death of another household pet. Remember that cat emotions are not identical to human emotions. Unknown to the owner, the deceased pet may have bullied the surviving cat(s) or they may simply have tolerated each other's presence without any sense of companionship. In such cases, the survivor(s) may be relieved at the removal of a stress factor or may be indifferent to presence or absence of the other animal. Some of the content of this article were previously published in "Time to Let Go" (pet loss/euthanasia), "Towards The End" (ageing cats) and "Do Cats Have Emotions?" all of which are published on the Messybeast website. This article on feline grief has been compiled due to popular request.